OK - so my misunderstanding about what you said regarding non-Bianchi vs Bianchi forks given a Tretubi sticker. I guess we can agree that regarding the green Bianchi fork tubing sticker that goes with the Tretubi sticker, that it is made of Colubmus tubing. The 1987 catalog actually has info on the tubing. Page 14. I've attached a screengrab. The CDI frame is described as: Bianchi Special Formula 2 Tretubi by Columbus in Superset Design. It's fork is made of Columbus Aelle. Moving higher up the list, the Limited, Nuovo Alloro, and Trofeo has the same frame, but with Formula 2 Fork. Moving even higher, the Superleggera, Mondiale and Giro is a mix of SL/SP with an SP fork. So looking at this, I doubt Formula 2 is a SL/SP mix, given that the highest-end bikes are made of that. But of course, we don't know. NO mention of Cromor anywhere at all on this list. Perhaps Cromor was introduced later (my 1987 and 1988 mid-range Bianchis have Formula 2, my 1989 mid-ranger has Cromor). 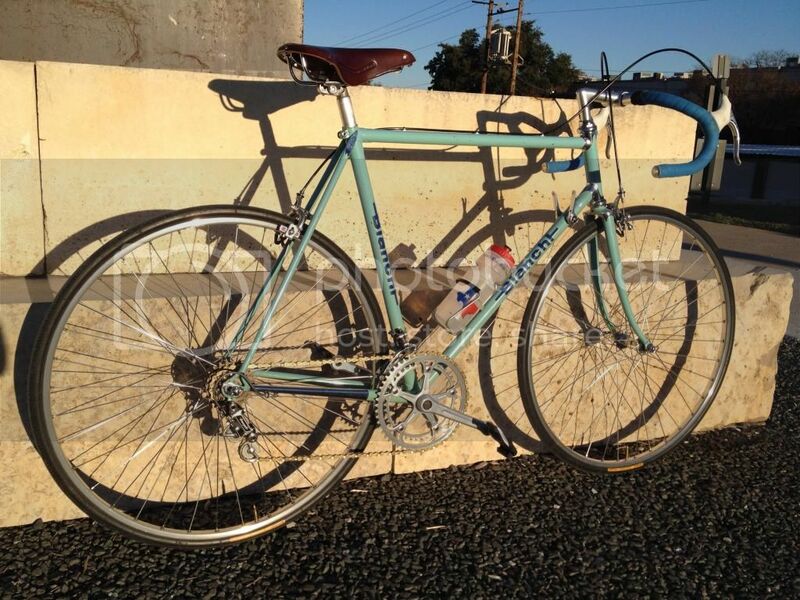 My opinion that Formula 2 ~ Cromor is because of the ubiquity of Cromor and Formula 2 in late 80s midrange Bianchi bikes. It seems for bikes in the same range (CDI, Quattro, Brava), they'll either have one or the other. It would seem to me that a full-Columbus tubing bike ranks a bit higher than a Tretubi frame (only 3 main tubes), and hence a "Cromor" Bianchi is ranked slightly higher than a Formula 2 frame. As such, it would seem logical that the step-down from a Cromor frame, is a Cromor frame with its main 3 tubes Cromor, with the stays some thing else. That was the reasoning behind my guess that Formula 2 Tretubi is Cromor-level. Again, that was my guess only and has no legitimacy whatsoever. As you say, perhaps it is made of SL/SP in the main tubes, but it just doesn't seem logical that it would be. But again, I don't know. Regarding your quote above, perhaps I'm not getting you or you're not getting me. What would you say is the ride difference between two bikes, one made by a master builder, and one made generically (on an assembly line). Last edited by armstrong101; 12-19-14 at 02:29 AM. Very cool, Arman! That's the bike that hooked me, way back when I was a teenager in the mid 80s..... Hope to see it out on a ride here sometime! It sure rides nice. It was to be a flipper, but I couldn't bring myself to letting it go after I rode it. 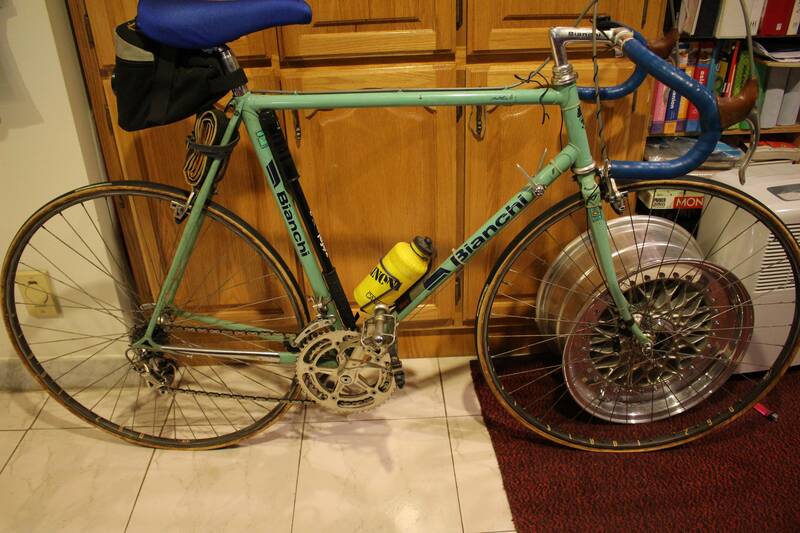 What tires you got on your Bianchi? Tubulars? Yeah, Dugast 32s. Like riding on pillows, and perfect for L'Eroica. Picked them up cheap from iab, and a second set at a swap meet last year. OK, I have determined that I need an English thread bottom bracket on my Mega Pro XL, but can someone tell me what length I need. I am thinking it will be a 102mm, I have a 2001 year 10 speed crank set. Last month sold My super Leggera 1988 according to the serial number. I couldn't believe how heavy it was, but thought it was only my warped opinion. Buyer drove a long way to pick it up in person. He commented although he was going to purchase it anyway, how heavy it was.. All Campy factory stock, just a very heavy bike for some reason. Just the weight of the bike! I have an 1986 X4 and I think it is quite heavy, although I love riding it. Heavy compared to....what? 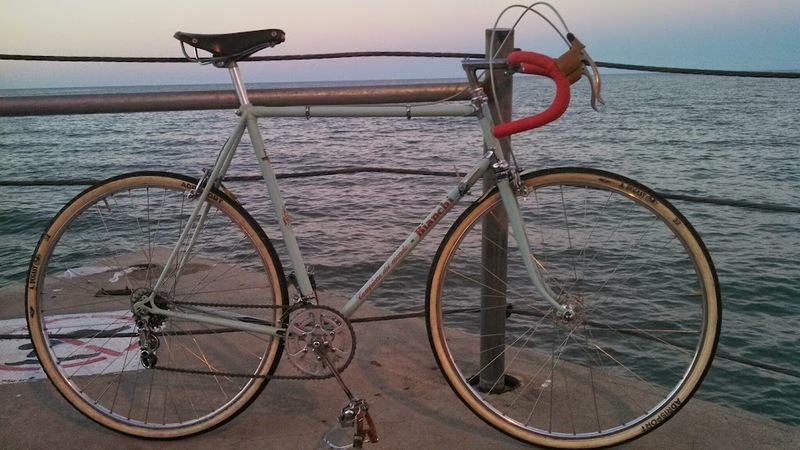 The '88 'Leggera is listed at 21.5lbs, and I would suspect that any comparable SL/SP mix frame (if there were any) with a full Chorus and basic clinchers like the Ambrosios would weigh in at about the same. If you put some trick tubulars wheels and tires on it you might savea pound or two but I suspect the weight is comparable to any similar bike of the day. That's what I'm talking about... That crank is to die for. How am I only now discovering this thread?! I understand that is what you may suspect, as did I, I can't explain it, maybe the original seat, Dense air in the clinchers, LOL, I don't know why it felt heavy, I didn't weigh it, as I don't like to see my weight lately on the bathroom scale, as I am getting ready for a trip on my job that may require it, but if personal opinion accounts for anything, the freakin thing was heavier than any bike of that era that I have, and I have more than enough to judge by. Truly, maybe the seat absorbed a lot of moisture , I owned the bike 25 plus years, I know you are partial to them, I probably love them just as much, but the superleggera I had was heavy, felt slow, and the new buyer while happy with it, after driving 6 hours, was about to change his mind after lifting it. Thank god I didn't have those first generation CCampy SGR pedals on it, they are like children's old peddle blocks on tricycles, made of Iron. It is still visible on the major auction ( sold ) site if you do a search, I was asking $1000. And truthfully, this hobby is based a lot on personal loves, opinions, and fond memories, so even compromising that the bicycle was normal weight amongst its piers, personal perception weighs ( no pun intended ) for alot of credibility, sometimes even equal to or stronger than fact. To all be safe. A few minutes later, its kind of similar to this photo of katiesmalls, I tell her she is just a full round ebony queen, like Oprah, or Al Sharpton, but, she really is H E A V Y, ( she can't spell ) As was I in 1980, I am whitey, with local Chapter Hells Angels gentleman and still one of my best friends, and yes he can still, well whatever. Last edited by Katiesmalls; 02-02-15 at 06:41 PM. 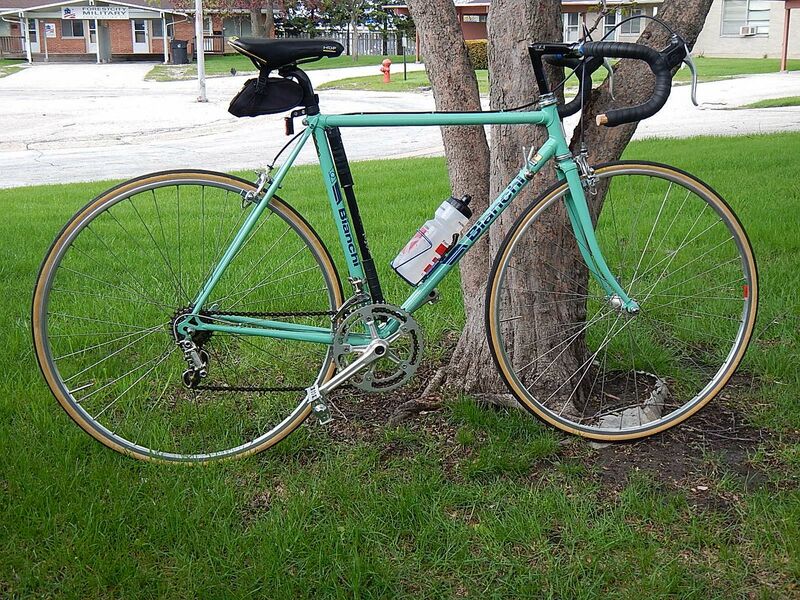 Here's my Bianchi- I've been harboring this a few years. Its equipped with a Campy Valentino on the rear with a Gran Sport-style on the front. 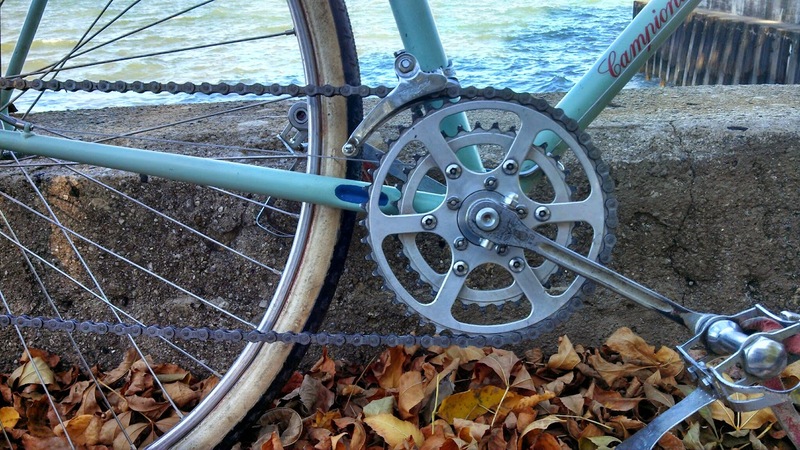 Campy hubs; I replaced the Campy Quill pedals seen here to make it easier for my GF as its actually her ride. The original Nervar Sport crank has been upgraded to an alloy Nervar; the original suffered a broken BB spindle. Rims are Mavic 'module E2' and the spokes are double-butted. Despite all that I think its a gas pipe frame but it sure rides nice! I gave it some wider gears to handle the hills in the area. Brakes are/were Universal 55s with Modello levers; I broke down and put a Tecktro on the rear which really helped out. I have the matching celeste air pump which didn't make it into the photo. I thought the strong shadow would be "artsy", but it just turned out to be really busy. I know the clipless pedals let it down but I'm not riding toe straps anymore. Thanks! I would love to find out more about this machine. I am thinking its a mid-line bike but it rides better than a TI framed bike I had (took it apart last year) and it gives my Paramount a run for the money. Whats the word with that BBS dished multi-piecer?